Picture on the left (grey) has buttons done up to make the wrap shorter, wrap on the right (black) the model is showing where the buttons do up. Shortened version front and back. I believe this is the Heathered White version but it’s hard to distinguish the two lightest colors in person so it’s even harder in pictures. The other one is called Heathered Clarity Grey. One was a very soft pale grey almost silvery white and the other was an off white champaign with pink undertones. Have you ever looked at all the white paint swatches from one brand of paint? Hence why I chose Heathered Blurred grey. Who can choose between two very similar off white colors? I like the Heathered Blurred Grey a lot though, its a warmer toned grey that doesn’t seem to wash me out and I like it’s versatility in my closet. I really love the knit detailing on the back. There is a pleat detail and on the inside the fabric is woven in a different way. It’s slightly thicker then the rest of the wrap and looks more like a waffle weave. The back of this wrap just drapes so beautifully front and back, closer to the body then the Live Healthy Wrap. The wrap fits TTS but you may want to try the size down just to see if you prefer the length difference. I grabbed an 8 and didn’t bother to try on any other sizes or colors. The arms are fitted and some may find them snug but I found them quite comfortable. These knits tend to loosen up with wear so if you find it just a touch fitted you will be alright. 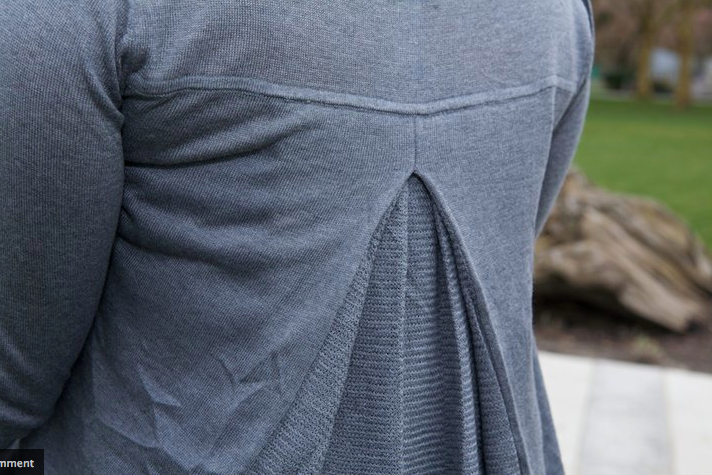 "Closeup Shot Of The Mudra Wrap, And, Lively Tee in Iris Wee Stripe"